The following top 5 swing thoughts relate specifically to shots made using irons. This differs from the way thoughts are organized elsewhere on this site where they are mainly categorized by the swing sequence they target. In a general sense, these swing thoughts account for the fact that the ball is meant to be struck before the bottom of the swing arc is reached, or in other words while the clubhead of an iron is moving down still. 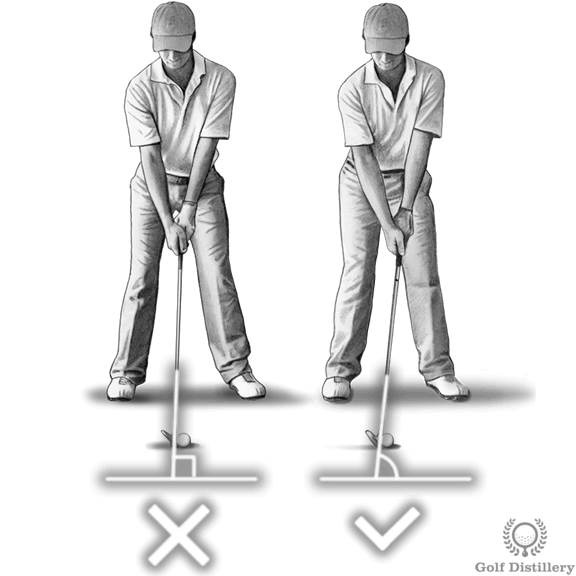 This swing thought reminds you to set up properly for a shot whenever using an iron and it concerns the position of your hands specifically. It involves pressing your hands forward a little so that the shaft of the club leans forward. Or in other words, it reminds you to position your hands a little ahead of the ball in contrast to placing them directly on top of the ball. This position is akin to the one you will aim for at impact. 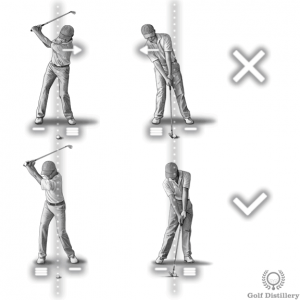 Indeed, a good iron shot will occur as the clubhead hits the ball and continues moving forward and down after impact. This can only happen if the clubhead lags the hands, or in other words if the shaft leans forward. 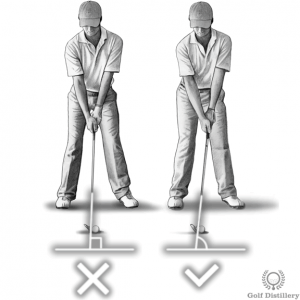 Essentially, leaning your shaft forward at address puts your body in the ideal impact position. Indeed, it promotes trapping the ball between the clubface and the ground as you hit down on the ball with your swing. Closely related to the previous swing thought, this mental image concerns the position of the club at impact and how it relates to the ball. Indeed, this swing thought has you imagining that you are trying to trap the ball in between the face of your club and the ground at impact. Rather than trying to scoop the ball and help sending it flying, you’ll be reminded to let the loft of the club work its magic and send the ball as high as the club was meant to. 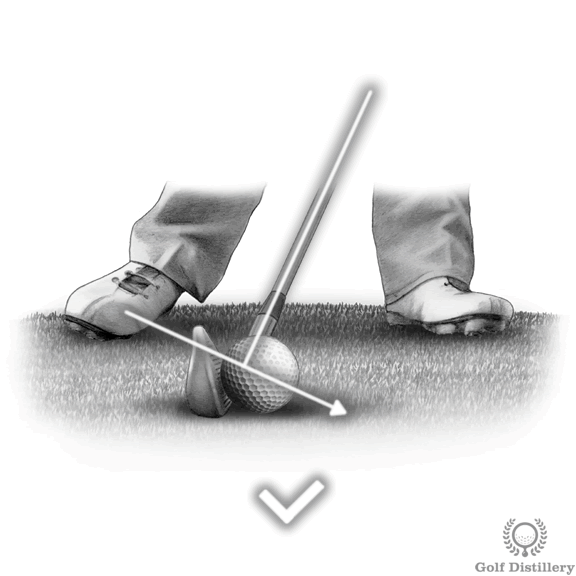 Essentially, this swing thought promotes a solid downward strike at the ball that sees the club hitting the ball first and digging into the ground afterwards. It also protects you from the flipping the club error. 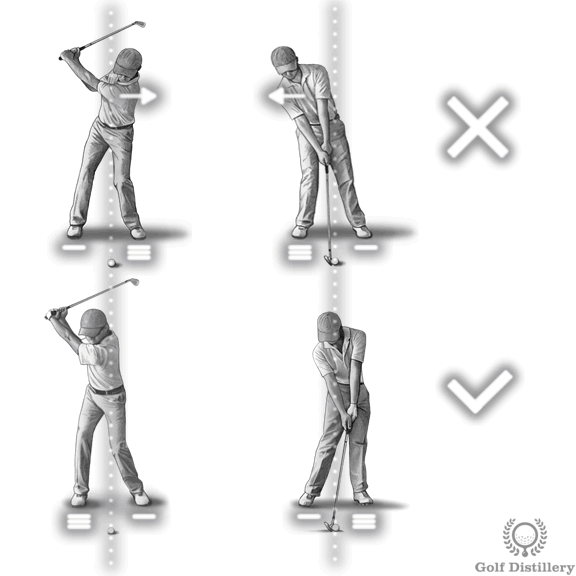 This swing thought reminds you of the importance of properly moving your weight during the course of the swing. Indeed, power is unleashed in golf not through big biceps and strong forearms but by the efficient coiling and uncoiling of the hips and shoulders and the transfer of weight that is associated with them. The reverse pivot error involves moving your weight towards the front foot during the backswing and towards the back foot during the downswing. As the name suggests it constitutes the reverse of what should happen. Essentially, focusing on properly moving your weight around during the course of the swing will remind you of the key role weight plays in hitting pure golf shots and shields you from the common reverse pivot swing error. This swing thought is meant to help clear your mind of any negative thought that may render your swing tentative and not as assertive as it should be. It reminds you that fundamentally, the goal of golf is to hit the ball. Whether it goes straight or long is another matter but essentially hitting the ball is what ultimately matters. Thinking about hitting the ball hard will also promote good swing acceleration into impact. And as an added bonus, it will help shield you from the dreaded deceleration swing error that will cause all sorts of problems with your shots. So whenever you are having issues with your swing and allow self-doubt to creep in, adopt this swing thought and witness the ball soar into the air. 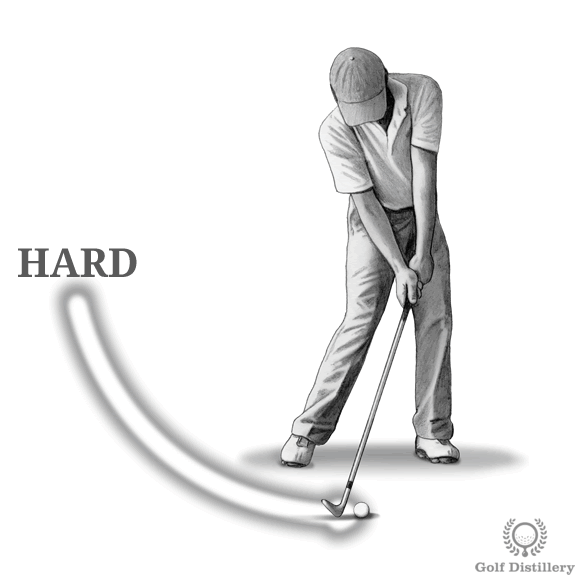 While it may sound contradictory, this swing thought is meant to complement the “hit it hard” that precedes it. Indeed, rather than be in opposition to each other the two are meant to be used together. 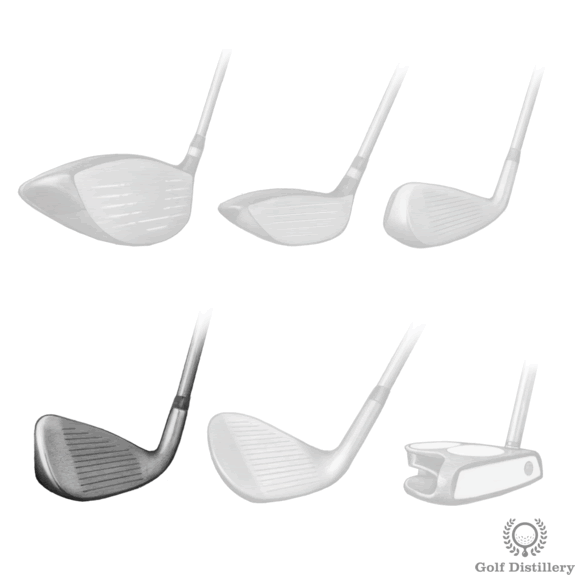 On the other end of the scale, gripping your clubs too tightly will create muscle tension in the wrong places which can create havoc in your golf game and in the shots you produce. 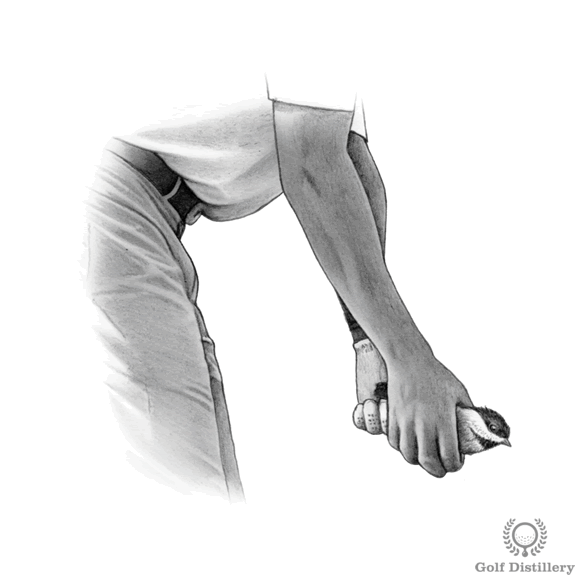 You are instead encouraged to grip the club lightly which will promote feel in your shots. It will also remind you that balls will be hit purest not when you grip the club tightly but rather when your swing accelerates into impact with vigor. Essentially, this swing thought is a solid complement to every mental image on this page and will help you produce more precise shots and swings with less muscle tension.